We know what you’re thinking, but that’s not a typo. AWSome Days (a play on words reflecting Amazon Web Services), are hosted around the world and will take you through a step-by-step deep-dive into AWS core services such as Compute, Storage, Database, and Networking. 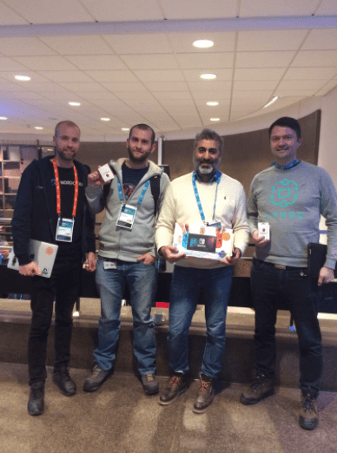 Nordcloud has been a proud sponsor since the first Nordic AWSome Day in Helsinki back in 2014, where we showcased our AWS Authorized Training Partner, AWS Premier Consulting Partner, and our ongoing dedicated partnership. We have a strong collaboration with AWS that has been going on for several years, and this has helped us provide an accelerated cloud transformation among our customers, from migrating to multiple cloud technologies, or assisting with cloud-based innovation. As an AWS APN Authorized Training Partner, we provide official AWS training, with the most up to date AWS services, and with certified training engineers like Olle Sundqvist, Michaela Vikman, and Juho Jantunen teaching the next wave of Cloud Architects. We currently host the following training sessions: Technical Essentials, Architecting on AWS, SysOps on AWS, Developing on AWS, Security Operations on AWS, and DevOps Engineering on AWS. We always have public and dedicated training going on, but keep an eye on our scheduled courses. We’re still running an amazing discount (AWSOME) on the courses at a huge 25% off until March 16th. Be sure to have a look at what’s on offer and don’t forget to register to get the discount. Nordcloud helps organizations use the cloud services from AWS, and other cloud providers to improve their productivity and efficiency. We look forward to attending a lot more AWSome Days in the coming months, and continue to provide a growing partnership with AWS, providing the best advantages for our customers! Hope to see you all at the next Nordic AWSome Days event in Helsinki this week! Finally, a big shout out to our Nintendo Switch winner Mehrdad and the two Raspberry Pie winners: Sturla and Leszek.